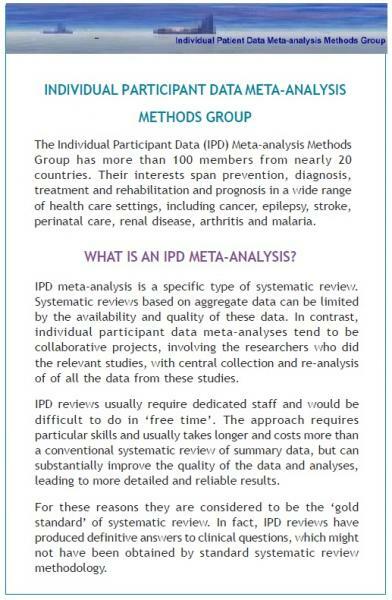 In April 1994, when IPD meta-analyses were relatively rare and there was little published guidance on how they should be done, a workshop (supported by the UK Cochrane Centre) was convened. Representatives of those groups with experience of conducting IPD reviews attended. They discussed the practical aspects of doing IPD meta-analyses and this led to the formation, and registration of the Methods Group in December 1994, with a full report of the workshop discussions published the following year (Stewart and Clarke 1995). As the use of IPD increased and extended into many areas of health care, new practical and methodological challenges arose. 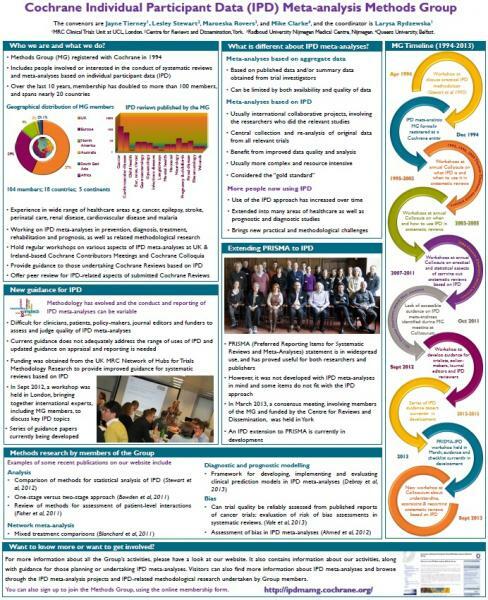 Therefore, the Group continues to regularly hold guidance workshops, on various aspects of IPD meta-analyses, at annual UK & Ireland-based Cochrane Contributors Meetings and Cochrane Colloquia, and provides guidance to those wishing to undertake Cochrane Reviews based on IPD.